While some managers like their one-on-ones to happen weekly, others prefer a longer one-on-one on a monthly basis. 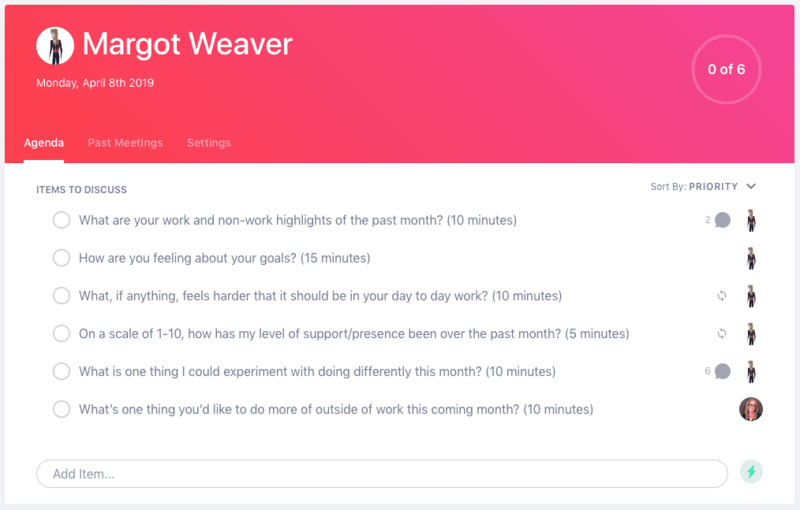 Switching to a monthly frequency lets you have deeper conversations, but it also requires a slightly different one-on-one meeting agenda. With that in mind, here’s a 60-minute one-on-one meeting template developed specifically for monthly meetings. Click here to jump to see the SoapBox monthly one-on-one meeting template in action! A lot can happen in a month. Starting off with a check-in on their work life, their personal life and their overall happiness is essential – it will help determine the main focus of the rest of your time together. Make sure to ask truly listen to the answer you get back, and, if needed, push them beyond the stock answers. Ideally, you’ll have access to a shared source (a PM tool, a Google Doc, etc.) where the team’s collective and individual goals are tracked. But sometimes numbers only tell half the story. Getting the qualitative details that go with the quantitative data is essential. This agenda item is so important, it’s on both our weekly and monthly one-on-one agenda templates. This is your opportunity to find improvements in their productivity. The goal here is to build a habit around finding the most effective way to do things – that’s why we suggest phrasing the question as “what feels harder” versus “what’s broken.” It keeps the conversation focused on solutions, rather than venting. Things change in the world of tech, and they change fast. Especially when your one-on-ones are happening on a monthly basis, you need to check in to make sure your team feels supported – and, in turn, engaged. This is a good opportunity to check-in on what your employees think of your one-on-one frequency, too. Requesting constructive feedback can be tricky – your team might have a hard time being radically candid with you. But framing it as a request for ways you can experiment as a manager is a great tactic It creates a safer psychological space for your employee, and will also encourage them to think more broadly about potential improvements. Think of these experiments as mini projects you’re both working on together – it will reiterate that you see your relationship with them as one of mutual learning and collaboration. If you’re only meeting one-on-one with your direct reports once a month, there will be a lot to cover. It’s easy to let the operational and work-specific stuff take over the agenda – but don’t skip over the personal stuff! Trust me: showing you truly care about your team’s work-life balance will do more for your team’s productivity and dedication than those extra 10 minutes of talking operations will. What are you least clear about, in terms of our company wide strategy and goals? How could we improve cross functional collaboration at [your company]? What other roles at [your company] do you find interesting? What skills do those roles require that you would like to work on?